First, for all of you who have seen the Fall Interweave Preview and sent e-mails - thank you! The upcoming issue features one of my sweater designs that I'm really excited about. If you've yet to catch the preview, check it out here - there's a bunch of great sweaters, it looks like a really great issue (though you can't really go wrong with Fall knitting, in my opinion). I designed and knit most of this while I was in Dublin last winter. Despite finding n'ery a yarn shop there, it was a great place to be inspired - plenty of wool, texture and color all around to get the creative juices flowing. The Cobblestone was a bar we spent an evening in listening to traditional Irish music on the North side of town - I thought the name was fitting. My goal with this piece was simple shapes that would feature a nice tweedy wool and a goodly amount of texture without overdoing it. It's worked seamlessly with a round yoke and garter strips up the sides (below the underarms). A nice cozy sweater that I'm really looking forward to having around this winter. Pictured is the medium size - my apologies for the wrinkles. I was forced to photograph this in a pinch, before wet blocking. You know how those deadlines are. Thanks again for all your support - it is always very much appreciated. Happy knitting! Thanks for showing more photographs of it. It is difficult to see much of the texture in the smaller online IK photographs. The side texture and bottom edging really bring it all together well. Wow, Jared. What a nice, simple, yet uniquely modern looking sweater. Yay for knittable guy patterns. My husband would look great in this! Thanks for the extra pictures too. It can be hard to see sweaters sometimes in the preview. I loved this when I first saw it! I will be making this for my husband!! Thanks for a great design! I love all your work! Great sweater, and your pix are so much better than the preview ones. Thanks for posting them. I did see it in the IK previews & I love it!! It is classic Jared - if I can't interest my son in it I may just make it for myself. This is another amazingly simple elegant design. What you do with garter stitch constantly surprises me. Thank you for sharing your talents with us. Congratulations! I agree, your pics are much better at showcasing the sweater's strong points. Now THIS is a sweater I might really knit - and wear. And I'm thinking my husband might get one for Christmas. Thank you. My beloved are a weird boy, he doesn´t approve of knitted stuff at all. But! This he likes! Even asked me about knitting it for him. Gorgeous! You've shown that simplicity doesn't have to be boring. Beautiful sweater. I think I like your shots better than Interweave's. It's beautiful and from the moment I saw it in the preview, I knew I would have to make it for my husband. Now, I just have to start spinning the yarn for it! It's a great sweater. I hadn't made the "name" connection to tie it back to you, but congratulations! Cobblestone caught my eye as soon as I opened the preview page. I think my son who is heading off to college in 3 weeks, would go for this sweater. He's going to be in the cold midwest, so I'm thinkng it is perfect as a Christmas gift for him! Now to pick the yarn! I agree...I like your photos better than IW's. Then again, your photos is my favorite part about your blog! Nice sweater! Congratulations!!! Your design looks like a classic! It is on my list to make. I saw this also on the preview and thought of my husband instantly. It just might be a little heavier than he likes for our NW climate. Gorgeous! Your sweaters - whether your design or not - are so inspirational. I'd like to add my congratulations! We all know how talented you are; it's wonderful that the whole IK readership will know now, too. This is, indeed, a simply classic sweater but I think that's what will appeal to my husband. The design and stitch textures work so well with that tweed. 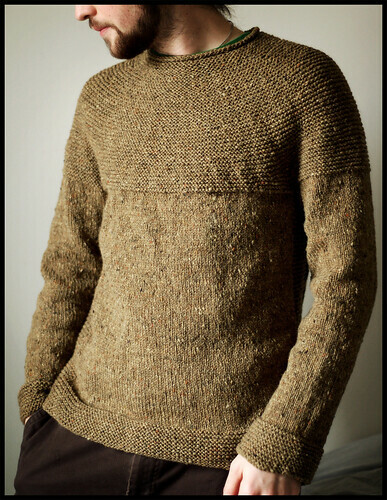 And finally, finally, there is something interesting and attractive to knit for men. Yay! A little giggle on my end, because when I looked at the preview I immediately thought of you (what with all the tweed and garter) but didn't look at the designer name. Congratulations! Holy cow, that is gorgeous!! I looked right by it on the preview page, but YOUR photographs are fabulous. I might have to buy that issue just for this pattern. My DH would look good in it. Or it would look good on him. Or something. I just have to make it. Congrats on the publication! 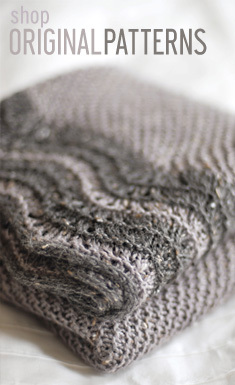 I love the textures of this pullover, and think the garter stitch really carries the yolk! Great job! Jared, I have to tell you, I looked at this sweater on the online preview -- without even looking at the name of the designer -- and thought, "That really looks like a Brooklyn Tweed sweater!" THANK YOU for designing and sharing a sweater that my very picky man will actually wear! That is a great sweater with or without wrinkles! I can't wait for the magazine to come out. I may just make this my first sweater and give it to my brother as a gift. Oh boy. That's going to sell a lot of magazines. Yay. How wonderful for you! Very exciting news. Jared - most excellent, per usual! And why is it that one can never find a great knit shop in seemingly obvious places like Dublin? The Pilgrim tromped ALL OVER Edinburgh last summer and found but one very disappointing yarn store. Very disappointing indeed. Beautiful city though. Great sweater - very simple but classy. Can't wait for the issue. I really like the simple yoke effect created by the garter stitch. Brilliant and chic as usual! You are one talented knitter! The sweater is perfect and I see you love that tweedy look and I do as well. I am a sucker for any tweed yarn even if I don't have a designated project for it. Knitting, spinning, where else do your talents lie? another stellar design, one that those fickle guys who are t-shirt lovers would wear. i loved hearing the background inspiration. i too noticed a remarkable dearth on yarn stores when in the isle, but that was a bit ago. odd, considering. Just want to say congrats on being in IK. The sweater is awesome. Glad I just upped my subscription! It is beautiful and perfect fit as well. Amazing how the simple garter can look amazing with special yarn. In one word - perfect! You are the best! When I saw the preview, I knew it had to be your design. It is fabulous! I think my brother may be receiving one for Christmas. I know a lot of people have already congratulated you, but I wanted to say something too...so congrats on making it into IK!! lovely pictures and lovely yarn and colour. i am the lucky owner of 15 skeins of it. this has the same qualities as kim hargreaves: beau which i knit up three of some years ago and which have been worn a lot and admired a lot. and then of course the design is uniquely yours. i was wondering why it was called cobblestone. howe gelb has a song about an american in denmark called cowboyboots on cobblestone which always amused me, and then it is the name of a bar in dublin, the loveliest place on earth to be in a bar. i will order the magazine and knit this beauty soon or later. Very nice Jared. Have been following your blog for almost a year and can't say I am surprised you are becoming one of the designers we see regularly. Congrats and keep up the good work. Hey, wow, congratulations on being published! OMG! I didn' realize that was your design submitted in IK!! VERY NICE Jard! Perfect name! Your photo is much more fabulous than the IK ones. Cool sweater. So glad you highlighted your sweater! I too was in Ireland last year (September) and was inspired by some tweedy goodness. Your pattern looks like it would make a cozy girl sweater too... might just have to try out some feminine mods once the FAll IK arrives. As always, I enjoy your beautiful photos. wow, a sweater my husband would actually wear.one i would even knit for him. imagine that. i think it's gorgeous. It looks so much better on you than on Interweave's model! Congratulations (again)! It's been said, but I agree that your photographs are better than theirs. It's beautiful. I just knit something remarkably similar for my younger son, now I'll need to make one for me! Have introduced my nephew to knitting via your site a few days ago (he fell in love with the Tomten) and we went back to look at it again together... and saw this and now I think he wants to be a knitwear designer! We'll see how he does on the hat first. De-lurking to say thanks and lovely stuff! Congratulations on both the fantastic design and the IK publication. I'm sure we'll be seeing a lot more of your work in their pages. The sweater is both classic and modern - not an easy design task. I didn't realize it was your design. It looked interesting, but the IK preview photos were too small to make out much detail. Thanks for the more detailed shots. And the pattern. While IK generally has better patterns than most, their men's patterns are so few that even one or two misses a year means very few decent designs per year. Congratulations on your sweater publication. It's simply stylish and functional for men sweater. Always enjoy reading ur blog and beautiful presentation. Congratulations on this nice sweater. It always puzzles me how wonderful men can knit if they knit. Unfortunately here in Austria hardly any men knit. Keep up your beautiful knitting! And you always find the perfect yarn to bring out the best in a pattern, be it your own or somebody else's. Like sj, my first thought when I saw the Interweave preview was "That has got to be one of Brooklyn Tweed's!" a wonderful garment, the shaping is perfect! Clever you! Beautiful sweater! Congratulations! I must run and get the magazined now. I wondered if that was yours when I scanned the preview...way to go! It's an incredibly good-looking design. EZ would have been proud. 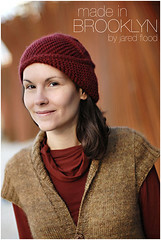 I saw this on the Interweave Knits preview and didn't realize it was yours. Wow! What a creative, yet simple, design. I'm adding it to my list. Congratualtions! I love the sweater, Jared (and have added it to my "to-knit' list)! Congrats on your publication! Waouh Jared, you're the greatest ! Congrats on Interweave! It's an awesome design - love it. 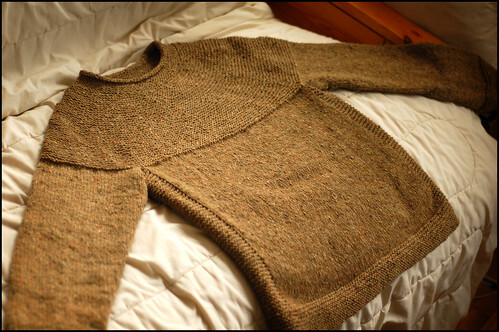 I want to make this for myself -- maybe with a neckline that stops a little bit sooner and has a pickup and bind off edge. The construction is the kind of thing I like to make. And I have to agree it's a great merger of yarn and stitches and style that exceeds the sum of the parts. To have left Dublin with a bit of inspiration and time to work on your jumper is a lovely souvenir indeed. Job well done and congratulations. De-lurking from Wicklow (Ireland) to add my congratulations to the rest for a beautiful design (ditto the photos). I really love the way the garter stitch yoke really does look like wet cobblestones and muddy hills. And...there's a goodly hint of monkish garb about it too. Me likey lots. Of course, in true Dublin tradition I can't resist a pun along the lines of...'wouldja look at that yoke there, isn't it fantastic!' Try and imagine it from Colin Farrell or Brenda Fricker if that helps. Next time you're in Dublin check out this yarn shop in Blackrock (about 4 miles south of city centre) This is Knit. Oh and let me know you're coming and I can point you to some others off the beaten track. I LOVE IT. ive decided this is going to be my first boyfriend sweater. but....can u suggest a similar yarn that is a bit softer? =) pretty please. it reminds me of a fatherly version of e.zimmerman's february sweater-- you certainly are embracing the beloved garter stitch. It's fantastic! Congratulations on publishing a pattern. Even if I am a girly girl, I want to wear it !! Congratulations for this pull-over !! Bravo !!! Wow, that is a great design! I like the detail stitches running down the sides - very cool! My husband's really picky and I think he would like this! I love the texture on that sweater! I just clicked on the preview and I have to say - your photos are better than the ones in the magazine! Your photography is always inpiring to me. This is an awesome sweater - I'm so happy for you! This sweater is just gorgeous!! My husband is very picky about sweaters and I am positive he will love this piece. I can't wait for my IK to arrive now! That is wonderful! I too have a picky husband, and he may be interested in this one. I'm looking forward to reading the pattern! I have been in love with that sweater ever since I saw it in the IK preview. Your designs are so aesthetically pleasing, and a breath of fresh air when it comes to men's knits. I find a lot of designs aimed at males tend to be either too boxy, too frumpy, or too busy. i love it I have been searching for a sweater for my dad and this is the one, it looks great. can't wait 'til that issue lands itself right into my hot little hands. Good work, as usual. I recognized your design in the preview right away. Wow! I love it and my husband's been asking for a sweater - this is going to be it! congratulations - the sweater looks awesome. looks like a great sweater to cozy up in. Love the design on the end of the sleeves and bottom of the sweater!That look great!! This design caught me immediately when I saw the previews -- it's gorgeous, and just perfect for my son's Christmas gift, I think. Gorgeous men's design. Thank you! Just bought the yarn for it. On sale at Webs for anyone else reading this! Wow! that's soooo pretty. I might need to make it for my boyfriend! And I must say, your pictures are sOOO much prettier than the preview pictures! Very handsome! As usual, your photographs are amazing. Congratulations on the publication and on the fantastic design! I can't believe you weren't able to sniff out a single yarn shop in all of Dublin. For heaven's sake, aren't there more sheep than people in Ireland?! I'm thrilled that you were inspired by Erin and produced such a gorgeous design. I'm anxiously waiting for my Fall IK to arrive in the mail. And if you aren't in the process of signing a book deal or putting together designs for a book, I might just start emailing Interweave Press myself about it! P.S. I sense a little EZ in your Cobblestone! She would be very proud of this one! Hi, I've been reading your blog for a while now and I love it! Great pictures, too. 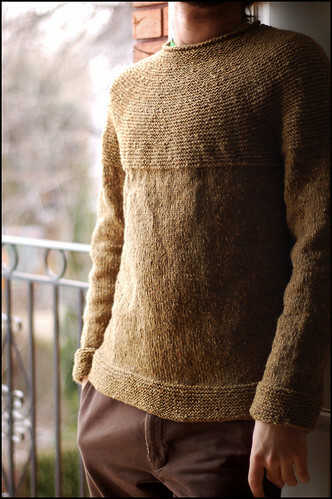 This is the sort of sweater my hubby likes and I am going to knit it. Please let me know if there is any suggestion with other yarn, too. I would like to look around. Happy knitting! wow, i think i'm about the 107th person to comment. i don't imagine you have time to even read all these. just wanted to say that i think your sweater is great. as always, i'm very impressed. i always look to your blog to inspire me. you remind me of all the great things i can aspire to knit and maybe someday design. thanks for the inspiration. sorry to be so cheesy. I love that sweater. Ooh, I want to hug the wearer, it looks so warm and cozy! It's beautiful and looks supremely wearable, as in--"my goodness, my guy would actually wear that!" Not something I say about most men's patterns out there. Woo Hoo! Just got my new Interweave Knits and immediately went looking for this sweater. Great work. Absolutely beautiful! Love the construction and the details that show in the tweedy yarn. stunning design. you are truly talented... and i love the yarn. thank you. Just got the fall issue yesterday. You're right, all the sweaters are nice. I was planning on knitting this one for DH, but I didn't know it was your design. Cool. Can't wait to get started. Love the sweater. You have a great talent for design and a very good eye. Gorgeous sweater -- and one I might actually make for one of the guys in my life. At last, a sweater design that a man would actually wear! I can't tell you how many times I've pointed out a pattern to my husband or older son, asking if they would like me to make that up for them, to be met by, well, sheer laughter. Your design is subtle, sophisticated, and something that would look smart on a guy. Thank you for giving me something to make for the men in my life! It is my second favorite design (but for Ann Budd's Tyrolean socks) in the issue. I particularly admire the short row shapings and that a guy would actually wear it. Bravo. This is the first sweater that my husband's given a sincere green-light to -- woohoo! :) In his words, "Could you be sure to make it with the yarn that has the flecks in it? Do you know what I mean?" So, some Skye Tweed in "Dungeon" is on its way to me! :) Thank you for a great design. Jared - My copy of IK came today in the mail. As I was paging through, your design arrested my eye. I said to myself, I know that name. How nice that the design was by someone whose blog I enjoy. I keess my leeps to you! What a design fantasteek, and a use sensible of garter stitch and short rows in ze yoke! Congratulations Jared! I saw your sweater in IK today and I was so proud for you! I know you must be thrilled. Since I have been following your blog I feel as if I know you :) It's like a great thing has happened for an old friend...good work! Congratulations! I love the sweater and I would buy the magazine for that pattern alone. It would look great on anyone, but I think I will make it for my son. Cobblestone is a smashing design! I particularly love the color you've chosen. It is so cool that you were inspired in Dublin. My life-long dream is to get to Belfast, the place where my grandparents were born. I brought the new IK last week. I love the sweater, and I want to make the sweater for myself. Just don't tell my hubby. Of course, I can make one for hime too. Hey cool! I just stumbled on to your site but already had my eye on the sweater for my son! Thanks! Congratulations! I just saw IK and love Cobblestone. I'm going to make two, one for DH and one for me. i can't handle how beautiful it is. i need to make myself a curvy version. or should i make one for the man? hmm. tough one. Lovely sweater. I hope you saw what Eunny Jang said about it on Knitting Daily. Just wanted to compliment you on your design. It's a very simple sweater, but I appreciate the dressmaker style detail you included in it-verticals at the side, and texture at the shoulder line should make most guys look buff (buffer? Depends on the fella). Congrats! This is the best pattern in the issue. This is great. I showed it to my husband Steve and he immediately said that he wants one. As soon as I see the magazine on the shelves (I looked for it yesterday at Borders but no dice) I'm picking it up and knitting it up. It looks like it's an easily customizable sweater...which is good as S has kinda a "barrel chest" and sometimes has difficulty with proper fits. Fab design. It is a must have pattern and finally pushed me to subscribe to Interweave. Your pattern will be returning to Ireland and will likely be walking the streets of Cork sometime this Autumn. I'm thinking of knitting out of Kilcarra Donedal Tweed. To heck with my BF. I'm making this for myself! Thank you, thank you for this great pattern! It was the first one I saw in IK that I said I have to knit - for me! My husband likes it too, but me first! I can't wait to talk to the owner of the yarn shop I work in to get her to order enough of the Tapestry Red colored Skye Tweed to make the sweater. Bless you for writing the pattern in a size that I can make for myself! Thanks again for a great pattern...I have been waiting for a pattern written in the round. I have this magazine on hold at the LYS just for this pattern. My husband is a 4x so I am hopping this one will be easy to adjust. He wants a sweater so bad. When I got my IK I was looking at your sweater thinking 'omg, I have to knit that! If only I had someone to knit it for!' And then a little light went off over my head - my dad is incredibly hard to shop for. Christmas is solved! I'm really enjoying knitting it, even though I'm only 5 inches or so in. I went over to my grandma's for dinner the other day and found out that she has the magazine, and want to knit the sweater for herself. Since she's considerably smaller, she was telling me about how she's just going to knit it how she normally knits it - top down, in pieces. I nearly had a heart attack! I mean, OK, I'm not knitting purist, but the thing I love the best of all about this sweater is just how elegant the construction is, and how well it all fits together. I'm trying desperately to convince her that it would be easy to just cast on fewer stitches and work it smaller, but she's skeptical about how that would work when you get to the yoke shaping, and my spatial visualisation is not so good. Any suggestions? Thank you for this sweater!! It is perfect for my first sweater project (making it for myself) and I cannot wait to finish it! I became an immediate fan of yours as soon as I saw this in IK. Thanks again! Such a simple, sophisticated pattern! I was wondering if the charted pattern is avaiable anywhere - so I could knit it from the top down? I'm making this for my husband - his first knitted gift from me! Thanks! This issue has sold out now. Any ideas where I can get a copy or buy the pattern? It's just beautiful. Have bought a subscription to IK now so I never miss out again. Jared! You knit so very well! And the Cobblestone pattern is wonderful and simple, exquisite. Is there any possibility to buy the pattern directly from you or? Haven't seen Interweave Knits here in Sweden and I also understand that the issue has sold out. This is a delightful sweater! I too, would like to get the pattern from you if I can. For those looking for the pattern, if you call customer service at Interweave publications they will send you a photo copy for $4.00. They may also have some more issues. I called and they said they had a few issues left so I ordered one and received it in 4 days. and is so very happy for it. Oh just started knitting this for my husband and it looks great so far. Just finished the sweater in walnut Tatamy Tweed. It's gorgeous! It's the first sweater I've knitted for my husband. It fits and he loves it. Thanks for such a great pattern.